From a simple one page, ‘This Is My Business’ website, or an attractive brochure-style design to a large, multi-page project – we will promote your business with the creation of a bespoke and unique solution getting your business online. The first question we get asked is – how much will it my new website cost? Here are some guide prices – remember that the cost will vary based on your unique requirements. The clearer and more concise your vision – the cheaper your new website will be. 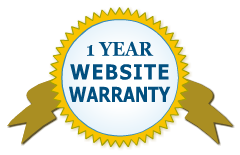 After the first year renewal is due for Domain Name, Website Hosting, Content Updates, and Maintenance. So you can get the best out of your new website development project, the steps below outline the process; from the concept, working through design and testing to the final deployment of your new website. To learn more about our Website Services please select a topic from menu, or if you already have the information you need then please Contact Us with your requirements.